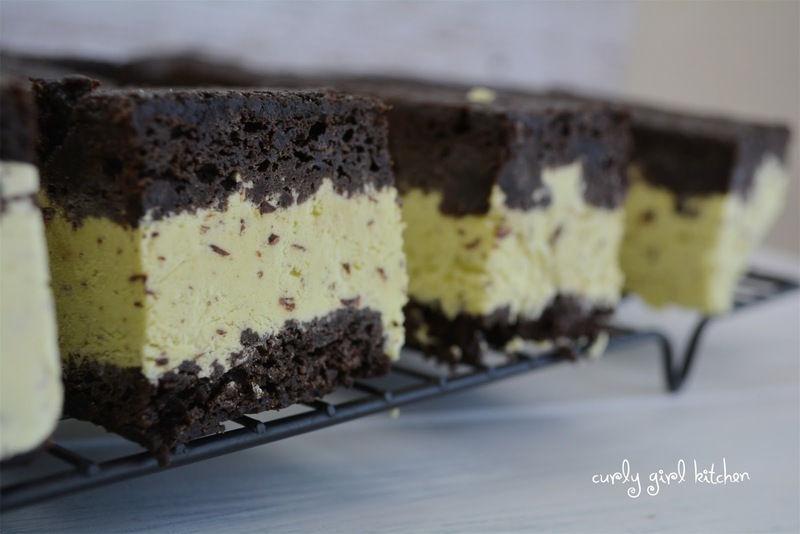 I had big plans for July to be "ice cream month" on my blog, with so many new ice cream recipes I wanted to make, but then I had to go and make a giant ice cream cake for my birthday, and we had more ice cream in the freezer than anyone could hope to eat. So then it just seemed silly to make more. Six weeks later, the ice cream cake was finally gone, and I started to think about homemade ice cream once again. There was the Pistachio, Shaved Chocolate and Brownie Chunk Ice Cream a few weeks ago, which was so fantastic. There is still some of that in the freezer, which is ever so tempting at 9:30 at night. Mint chocolate chip was always a childhood favorite, although since my dad insisted on buying nothing buy Breyers, we rarely had green mint chocolate chip ice cream at home. They don't make theirs green. Which is fine, of course, since it's more natural and all that. Still, though... I like the green color. It just looks more... minty. Other than the unnatural addition of green food coloring, I did want my ice cream to be naturally flavored just from fresh mint leaves, with no extract, so I started by steeping mint in cream and milk for an hour or so before adding the egg yolks and sugar to make the custard. It was rich, silky, smooth, and very minty, cool and fresh tasting. With the custard chilling in the refrigerator, I made a pan of brownies so that I could make ice cream sandwiches. Dark, fudgey and cakey, these brownies are perfect for turning into ice cream sandwiches. So with the brownies baked and cooled, and the custard chilled and churned, I put it all together, spreading the ice cream over the bottom layer of brownies and topping with the top layer, before putting the whole thing in the freezer to get firm. 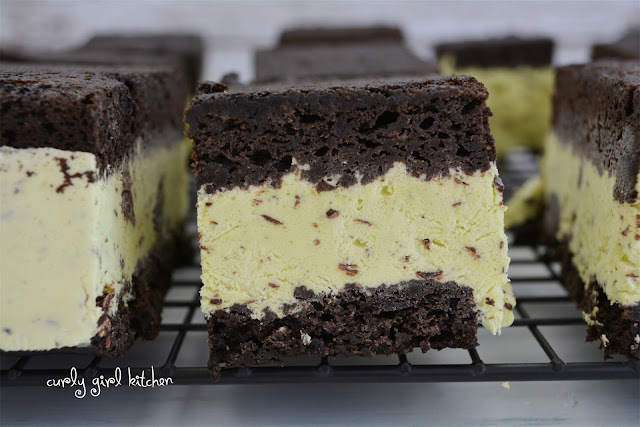 There's a lot of steps and a lot of waiting with this recipe - waiting for things to bake, cook, cool and freeze - but it's all well worth it when you get to turn out the pan of brownies and ice cream onto a cutting board and cut them into pretty sandwiches. For a little extra prettiness, I wrapped mine in brown paper and tied them with twine ribbons. We have so many of these in our freezer right now, they're going to last a while, that's for sure. 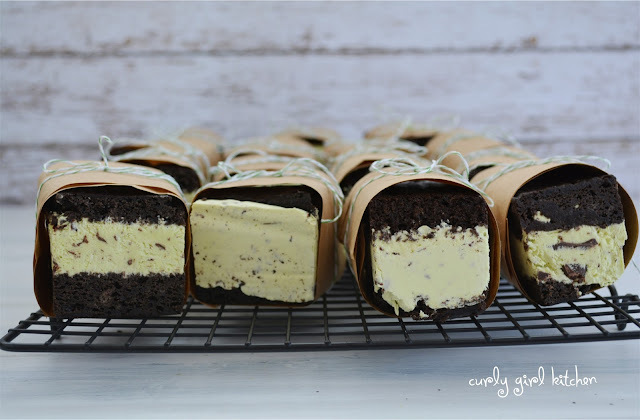 But the good thing is that it's my turn to host book club next month, and I'm pretty sure I will be serving these ice cream sandwiches for dessert. I hope the girls don't mind. Combine the cream, milk and mint in a saucepan. Bring just to a simmer over medium low heat; remove from the heat, cover and let steep for one hour to infuse the mint flavor into the cream. Return the cream mixture to a gentle simmer over medium heat. In a separate bowl, whisk together the egg yolks and sugar. Slowly stream one cup of the hot cream into the eggs, whisking them constantly. Scrape the egg mixture back into the saucepan; cook the custard, whisking constantly, until thickened enough to coat the back of a spoon. Remove from the heat and whisk in the vanilla. Pour custard through a mesh strainer into a bowl, to strain out the mint. If desired, add a little food coloring to tint the custard green. Cover the custard with plastic wrap, right against the surface, and refrigerate until well chilled, preferably overnight. Churn the custard in your ice cream maker according to the manufacturer's instructions, adding the chopped chocolate during the last minute. 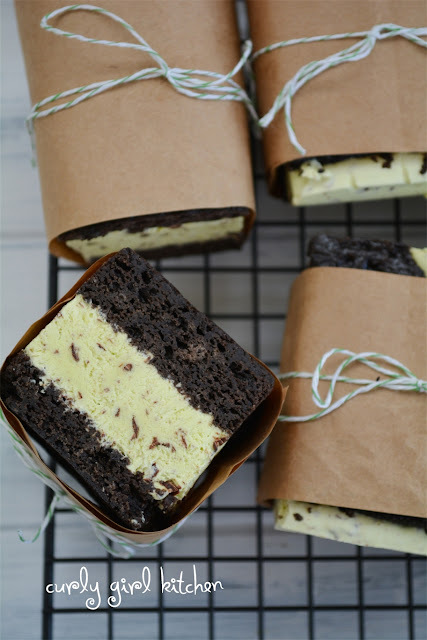 Transfer to a container and freeze until firm, about 4-6 hours, or if making ice cream sandwiches, follow instructions below and use the ice cream right after churning while it's still soft. Preheat the oven to 350. 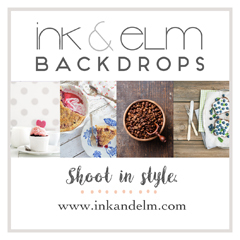 Take two identical 9x13 pans and line them with a sheet of parchment paper so that the paper hangs over the two long sides by several inches. Spray the paper and the two exposed short sides of the pan with non-stick spray. If you don't have two identical pans, then you can bake the brownies in a rimmed cookie sheet (which will yield one large thin layer), lined with parchment, and cut the whole layer in half down the center to make the top and bottom of the sandwiches. 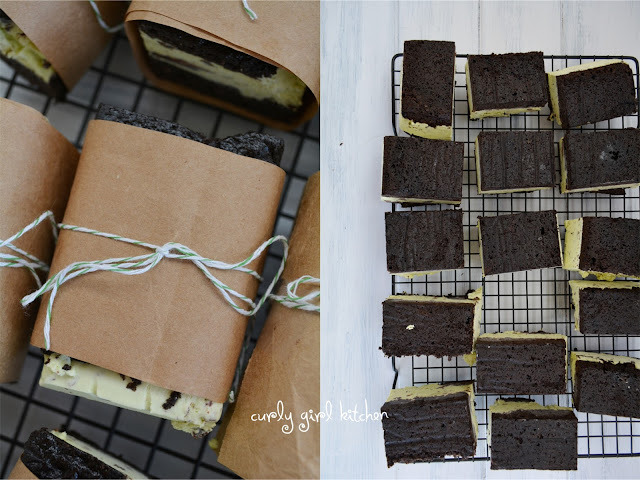 Note: I did neither of these, and just baked one layer in a 9x13 pan, planning to split it into two thin layers. This proved to be extremely difficult, as the brownies did not want to slice into clean layers, such as a cake might, so I would highly discourage this method. It's much better to bake two thin layers than to try to split a thicker one. In a large bowl, whisk together the melted butter, sugar and cocoa powder. Whisk in the eggs, vanilla and buttermilk until smooth. In a separate bowl, combine the flour, salt, baking powder and baking soda, and stir the dry ingredients into the wet just until moistened. Spread the batter evenly into the pan/s. I baked my thick brownie layer in a single 9x13 pan for about 18-20 minutes, but for thinner layers baked in two pans or in a cookie sheet, the baking time will be less, maybe 10-12 minutes. The brownies should look slightly puffed, but still a little gooey in the center. Let the brownies cool completely in the pans, covered loosely with a clean kitchen towel. While they're still warm, press the puffed areas gently with your hands, to ensure nice flat layers. 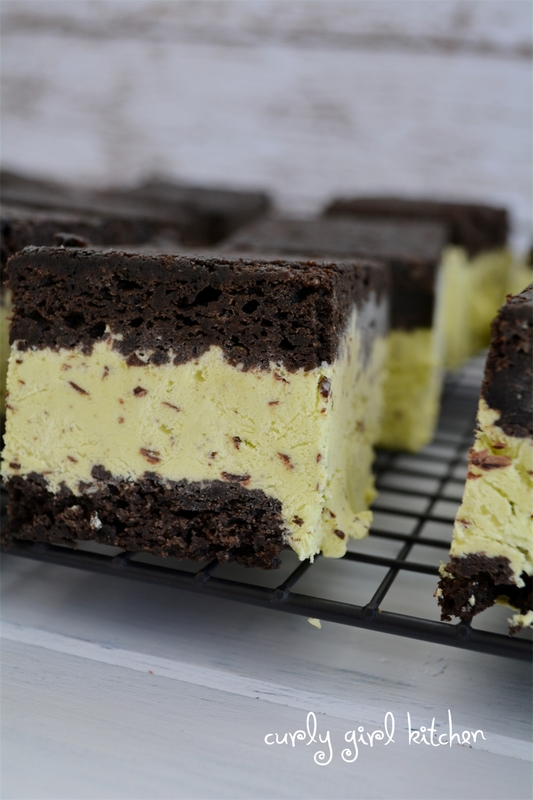 To make the ice cream sandwiches, have your cooled brownie layers ready and your ice cream, just churned, so it's at soft-serve consistency. Leave one layer of brownies in the pan, for the bottom layer. 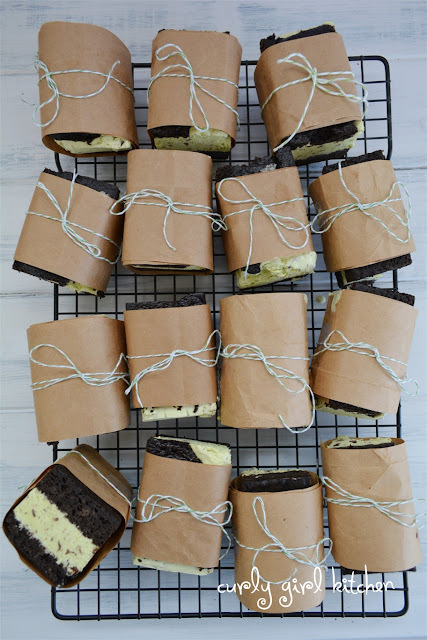 Remove the other layer of brownies, for the top layer, by grasping the parchment paper by the overhang and carefully lifting the brownies out of the pan in one piece. Spread the soft ice cream evenly over the bottom layer. 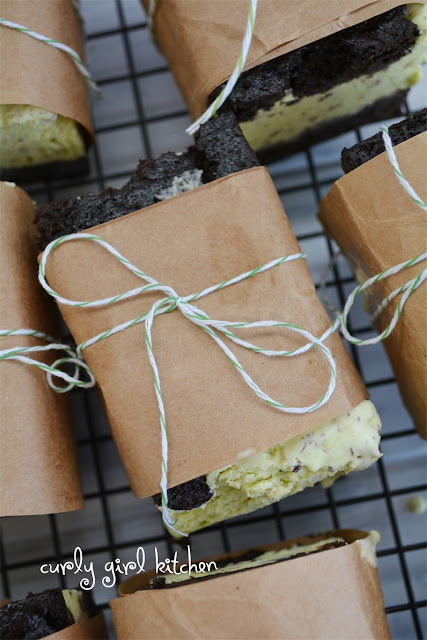 Place the other layer of brownies on top of the ice cream and peel off the parchment paper. Press the top layer gently into the ice cream, making sure it's all nice and flat and even. Cover the pan with plastic and freeze until the ice cream is very firm, at least 4-6 hours, or overnight. Once frozen, turn the pan over onto a large cutting board; it should come right out since there's parchment under the bottom layer. Peel the parchment off. With a sharp knife, cut into individually-sized ice cream sandwiches. If you want to wrap each sandwich in paper, keep the ice cream sandwiches in the freezer while you cut all your strips of paper and lengths of twine, then take one sandwich out of the freezer at a time to wrap. Put all the wrapped sandwiches in a container and return to the freezer until ready to serve.